When you are unfortunately stricken by polio, amputated for unexpected incident or simply can't walk for other reasons, you can't help but feel helpless and disillusioned. While some may be able to support their physical inadequacy, this is not at all the case for some who are financially constrained. A standard wheel chair will typically cost around PHP 3000.00 and for families who cant barely provide meals three times a day, a wheel chair is least of their concerns. This has been the goal of Mason Dadiangas Lodge No. 225 since the birth of Wheels of Hope Run last year. 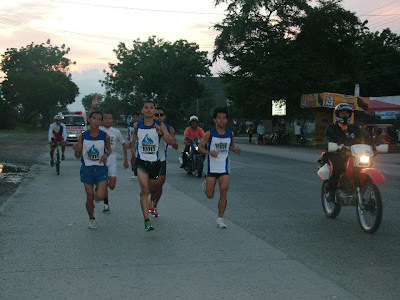 With more than 300 runners who participated in one of the best organized fun runs in General Santos City, the Wheels of Hope or simply the WOH had provided wheel chairs along with other assistance among at least 16 families. 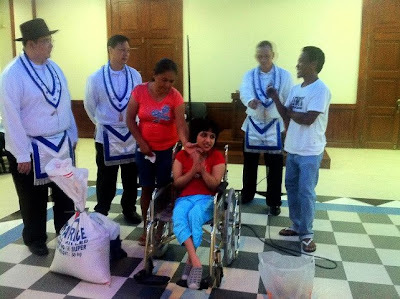 While the number of assistance rendered from the last WOH is overwhelming, this alone would not suffice as more is needed to address the demand of those who are in dire need for wheel chairs. 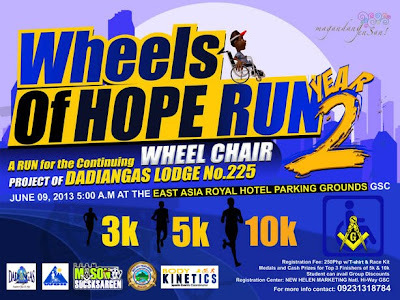 You too can help as Wheels of Hope Run continues its wheelchair program and it shall unfold on June 9, 2013 with 3km / 5km / 10km race categories at East Asia Royal Hotel parking grounds, General Santos City. Your registration fee of Php 250.00 shall include a race singlet and race kit or you may pay Php 100.00 for race kit alone. Elementary and high school students may avail of discounted registration. Medals and cash prizes await top 3 finishers from the male and female categories of 5km and 10km race. Registration shall start on May 9, 2013 at New Helen Marketing, National Highway, Almar Marketing, Magsaysay Avenue or at Kreativ Boutique, Upper Level, Gaisano Mall, Gensan City. For more details, you may find them on Facebook at https://www.facebook.com/WheelsOfHopeRun or you may contact this number, 0923-131-8784. Let us make a difference to the ones who need help, let us give HOPE to the ones who see nothing of it. Join Wheels of Hope Run Year 2. See you on the road!